Next on the way was Magnetic Hill which we skipped for the later. We were going by Indus river all the time and soon we were at the confluence of two major rivers of the region - Zanskar river and Indus river. It's a beautiful site actually. Zanskar meets Indus almost perpendicularly. Difference in the color of two rivers is so obvious here. 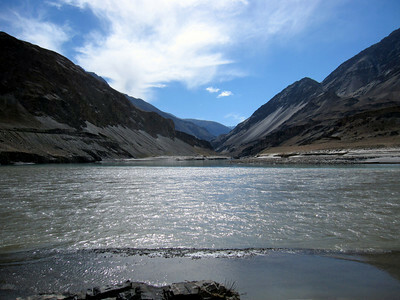 Zanskar water is greenish, while Indus is brownish. We basked in the beauty of this place for some time, took some photographs and moved on. We reached Alchi about an hour drive later. It was all deserted there. No tourist except two of us (three more people - two Germans and one Indian - came later while we were there). We went around the monastery and discovered that Indus flows just in the backyard of the monastery. Huh, Interesting. We entered the first temple of the monastery and instantly felt the sacredness of this thousand years old place. It was dim inside, to protect the wall-paintings made so long ago. There were some wood structures to support the roof and pillars of the temple which seemed weary now after so many years of existence. There were large, 2-3 floors high statues of various incarnations of Buddha. There were 3 more temples like that. We spent relaxing time there in this peaceful monastery. We had maggie for lunch on our way back. This time we also stopped at Magnetic Hill. Our driver stopped the car on a down slope and released the brakes, and bravo! the car started moving backward, by itself. Wikipedia says that it's some sort of optical illusion. Whatever it is, I could not make it out. We enjoyed the phenomenon :) We returned to Leh well in time but didn't do anything much for the rest of the day as Disha was pretty exhausted already by the car travel in the hilly region. Next day, at around 9:45 a.m., we started our 2 days excursion to Pangong Tso(Lake) - one of the most beautiful places in the world. This time I realized that the road to Panong Tso is quite difficult or may be the recent flash flood had made it worse. The road passes around some jaw-droppingly deep gorges looking into which makes your heart come to your mouth. About half way, we were met by Chang La - world's third highest motorable pass. It had snowed there (actually it snows pretty much every night there) and it was milky white all around with bright sun up in the sky. Beautiful site. It was very chilly out there with temperatures around -4 C. Thankfully, good folks of army have set up a small shelter here where they have put up a heater and offer tea to frozen and chilled tourists :) We also made use of the facility and came back to our senses. A pass is the point on the road where you cross over the mountain and get to the other side of it. Technically it's more than that, but to a traveller, a pass means the highest and the most difficult point on the road, after conquering which the travel becomes easier. The road on the other side of Chang La was in bad shape because of snow and ice, but it was still easier than going up to Chang La. We reached Pangong Lake at around 2:15 pm. I always run out of words to describe the beauty of this lake. We're dumbfounded when we saw it. Shades of blue and green that we never imagined could exist. Mountains of various colors standing on either side of this lake as if they were Gods themselves who had converted themselves to mountains to be able to keep looking at this eternal beauty. The water so clean that you can see stones in the bottom of the lake for a long long distance. And then there is interplay of sun rays and clouds, or it's just the wish of the Gods because there were very few clouds, that the colors of the lake keep changing. There was no sound except of the water and the wind. This place is eternally peaceful in all ways. We cherished our time there. As the sun started to set down, it became very cold there. It was time to go back. We bade our farewell to Pangong. Until next time. During our return, we stayed in the Tangse village for the night. 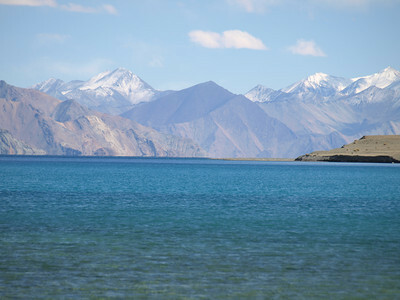 It's about 35 kilometers from Pangong and the nearest human habitation. As luck will have it, we stayed in the same guest house that all the actors of "3 Idiots" stayed in for 5 days. Moreover, we were in the same room in which Amir Khan stayed. Disha was all smiles hearing this :) There was another group staying there - a study group from the Pune university who were doing geological research of the Ladakh region. Interesting job, I'd say :) Guest house lady cooked a lovely dinner for us. We had a good sleep. When we got up next day, we were well rested and ready to conquer Chang La again. We reached Leh by the lunch time. It was our last day. We were flying back home next day early morning. In the evening, we settled our bills for the stay and the food. Phuntsok didn't let us pay for the numerous teas we had had there. Stubborn girl :) Dawa's father gave us the stoles that are offered to Ladakhi couples as a blessing, and a beautiful gift from the whole family. These gifts and his reassuring and loving smile touched deep in our hearts :) We were moved. What a lovely end to our first Ladakh trip after our marriage. Next day, early morning, we flew back. awww..this is so beautiful and mesmerizing! ..and the gifts from Phuntsok family - so touching, I could cry! Thanks for the beautiful write-up Manu! It's too long, so I didn't read. I just browsed those beautiful pictures, but I will read all of your Leh posts when I plan for a trip. So keep your blog running till then. These are absolutely beautiful photos. I was lead here by your paper on Packet Sniffing (which I would like to thank you for; it's proving very useful for my report on ARP Poisoning). I came to this site expecting more tech papers, and instead I find catalogue of beautiful photos. this blog is simply great.